Wednesday, October 23 7 p.m. The Siskiyou Music Project welcomes back Nashville-based Americana-jazz father & son duo, Tim & Myles Thompson on Wednesday October 23 at 7 p.m. at Paschal Winery. Since forming as a duo in 2009, the father-son act has entertained audiences from coast-to-coast, performing high-energy instrumental and vocal duets of improvised originals and classics reminiscent of legendary artists such as Chet Atkins, Stéphane Grappelli, Chick Corea, Jackson Browne, and often times compared to Bela Fleck and Dixie Dreggs. Although influenced by the masters, their down-to-earth musical style is all their own — a one-of-a-kind combination of improvisational jazz, singer-songwriter, country, rock and World. A native of northern Minnesota, Tim’s guitar playing, vocals and songwriting reveal his Midwestern musical roots with a hint of Americana Nashville. 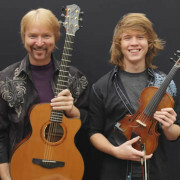 Audiences smile and tap their feet as he layers intricate melodies, chords and textures with his acoustic and electric guitars while his son,18-year-old Myles, answers and/or takes the lead with soaring and drifting echoes on violin. Tim’s unique technique, intricate and fun arrangements helped him win the International Fingerstyle Championship in 2008. Tim has released seven solo albums — one showcasing his talents as a singer-songwriter. The duo “Tim & Myles Thompson” has released one CD “Road Runner” and most recently a DVD “Tim & Myles Thompson Live”. Tim’s music has been used in film (Casper’s Haunted Christmas), TV, and software (Flip Video Camera). Tim has performed with popular acts such as Crystal Gayle and Highway 101, appeared on National Public Radio stations around the country, and shared billing with guitar icons Tommy Emmanuel and Phil Keaggy. Myles’ touring career, which started at age 13, has taken him and his guitarist father coast-to-coast in the United States (including the Virgin Islands), as well as other countries such as England, Romania, Cyprus, Norway, and Canada, opening for popular acts such as Spyro Gyra, Smooth Jazz Saxophonist–Richard Elliot, Lou Marini (Blues Brothers) and country/pop legend Don Williams. The father-son, give-and-take approach is fun-filled, leaving audiences inspired with a sense of family and friends. The Siskiyou Music Project presents from Argentina, The Alejandro Ziegler Quartet at the Old Siskiyou Barn in Ashland. Since 2007 The Alejandro Ziegler quartet have developed their own unique style of tango music reflecting both innovation and tradition.The ensemble is a new synthesis of the traditional tango orchestra.They developed their style inspired in the music of Di Sarli, Pugliese, Troilo and Gobbi among others.Various grooves and different ornaments reveal the members personal playing styles and on stage the communication between the four musicians is allowing, expressive, playful and tight. They flirt with a chamber musical expression without ever leaving the unpredictable spontaneousness within popular music and improvisation. Alejandro Ziegler ‘s own compositions come alive through surprising arrangements as well as intimate interplay. With their unique mix of tango, improvisation and romantique, they have gained territory all over the world with their special sound. Their focused performances are a complete acoustic, dynamic, and musically masterpiece one should never miss. The Quartet features Matias Rubino, Bandoneon, Nelson Aburto, Doublebass, Alejandro Ziegler, Piano, Conductor and Ignacio Quiroz, Violin. Friday, September 27 at 7 p.m. Location: The Artistic Piano Gallery in Medford. The Siskiyou Music Project presents the Mark Levine Trio on Friday, September 27 at 7 p.m. at The Artistic Piano Gallery which is located at 1390 Biddle Rd #102 Medford, OR. His interest in Latin jazz led to work with Mongo Santamaria, Willie Bobo, Moacir Santos, Francisco Aguabella, Pete Escovedo, and Cal Tjader (including Cal’s Grammy-winning Concord Jazz recording “La Onda Va Bien”). Mark has continued to pursue the Latin side of his craft, attending Centro Nacional de Escuela de Arte in Havana, Cuba in 1997. Twice, Mark has been the recipient of a National Endowment For The Arts Grants (1975 and 1977) and was awarded a “Jammie” as Best Bay Area Jazz trombonist, 1983-1984 (no, he no longer plays trombone, but he has taken up the gimbri, a Moroccan 3-stringed lute). Mark Levine has played/recorded with Woody Shaw, Mongo Santamaria, Joe Henderson, Willie Bobo, Bobby Hutcherson, Moacir Santos, Freddie Hubbard, Cal Tjader, Wallace Roney, Tito Puente, Milt Jackson, Harold Land, David Liebman, Blue Mitchell, Pete Escovedo, James Moody, Art Farmer, Dizzy Gillespie, Sonny Fortune, Eddie Harris, Stefon Harris, Eddie Henderson, Clark Terry, Ingrid Jensen, Charlie Rouse, Bobby Watson, Chet Baker, Mark Murphy, Art Pepper, Julian Priester, Bobby Shew, Victor Fields, Steve Turre, Madeline Eastman, and Poncho Sanchez among others. 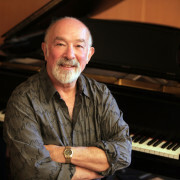 As an educator, Mark authored “The Jazz Piano Book,” which has become the bible for jazz pianists all over the world. Available in English, French, German, Spanish, Italian, Japanese and Korean. In 1996, he completed “The Jazz Theory Book,” with similar success. Guest Clinician and residencies at schools in Australia, Austria, Belgium, Canada, China, Colombia, Denmark, England, Finland, France, Germany, Holland, Ireland, Italy, Iceland, Mexico, Sweden, New Zealand, Switzerland, and Wales. In the early ’90s, Mark produced The Jazz Masters Clinic Series, a combination workshop and master class taught by touring artists passing through the Bay Area. Featured artists included Cedar Walton, Mulgrew Miller, Kenny Barron, Elvin Jones, Eddie Palmieri, and Tommy Flanagan. Additionally, Mark is the pianist on more than a dozen of Jamey Aebersold’s play-along series. Reservations:by Email or 541-488-3869 This show is now Sold Out. The Siskiyou Music Project kicks off it’s fall season with the all-acoustic Gonzalo Bergara Quartet on Wednesday, September 18. 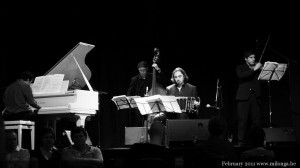 The group plays a modern variant of 1930s Django Reinhardt-inspired gypsy jazz. Composer and lead guitarist Gonzalo Bergara mixes a cascade of arpeggios with the sounds of Paris and his native Argentina. His first CD, Porteña Soledad, was Editor’s Pick in Guitar Player Magazine, and Vintage Guitar Magazine called it a “masterpiece.” The Gonzalo Bergara Quartet consists of Gonzalo Bergara on lead guitar, Jeffrey Radaich on rhythm guitar, Leah Zeger on violin, and Brian Netzley on upright bass. 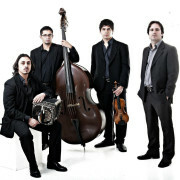 The music is heavily influenced by Django Reinhardt and the Hot Club of France, as well as the traditional jazz and music of Bergara’s true home, Buenos Aires. “Gonzalo Bergara’s music exists in a way that very little music does. He has lavished such care on every phrase, built each arrangement with such lapidary precision and pared away anything extraneous, the music becomes sculpture. It has weight, density, gravity. This is serious….and deeply moving.